The PE/PP Film system is designed for washing plastic films with contamination levels exceeding 80% Minimizing the recycling water flow rate and evaporation losses. The pre-treatment module of the system is equipped wear resistant design to maximize system up time. 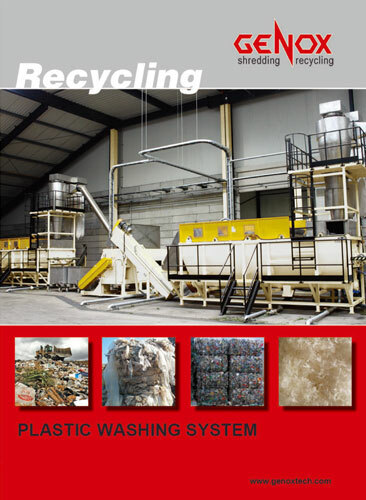 Pre-shredding and pre-washing system removes a large percentage of abrasive materials (sand, grit etc.) to protect the rest of the system. Shredding system is designed specifically for film materials to create a uniform particle size which is easy for washing and drying. High speed washing system optimized according to the specific material type liberates and separates contamination from film flakes. Under water force-washing paddles in our washing tanks maximize the washing efficiency. Our drag chain discharge device regulates the material discharge speed and minimizes the water volume sent to the drying process with the product. Mechanical (centrifugal and squeezing) and thermal drying systems control the moisture content of the finished product. At < 5% moisture the material is suitable for high quality pelletizing. Shredding, high speed washing and drying stages are optimized to avoid over processing which can cause material loss (fines creation). Intelligent system automation ensures that components actions are sequenced and monitored. Therefore, system capacity is maximized, and the system is effectively protected against un-shredable materials.